I purchased this as a gift for my daughter. This was exactly what she wanted so she was very pleased. Good quality and looks great on her. Practicality meets luxury with this sophisticated Michael Kors chronograph watch. Featuring a stainless steel bracelet complemented by a white crystal paved bezel and matching crystal markers. With three subdials and a convenient date display at 4 o'clock, this women's watch by Michael Kors is the perfect accessory for everyday wear or a special occasion. This watch is everything I expected it to be. It's classy and sharp and isn't too fancy to wear with casual dress. I think the size of the face is perfect, it's not too big like some watches. I just love everything about it! Love this Michael Kors watch, image was clear and matched what I received :) Happy with my purchase. It just looks so good. Shows class. Love how it sparkles in light. 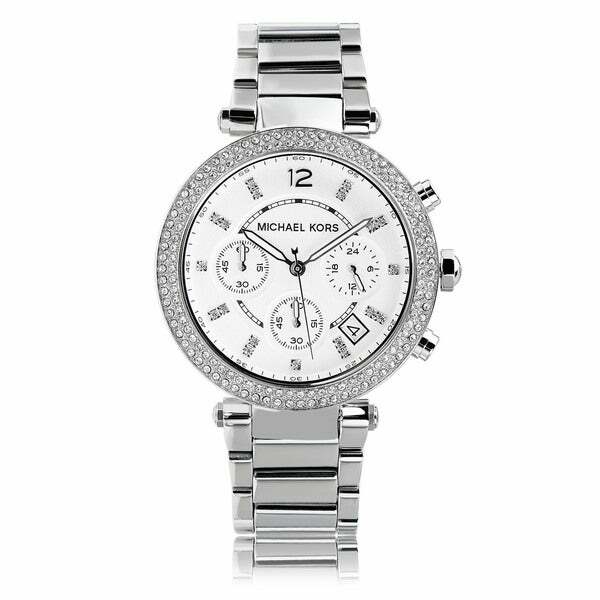 Michael Kors delivers style with this chunky ladies watch. My daughter loves it. I’m a lover of Michael Kors watches and this one is another beautiful watch. I love the rhinestones that are in the dial in place of numbers which makes this watch something extra. I love love love my new watch. This watch is beautiful and with the extra dials that actually work. Of course it's like a man's watch, but with a glamorous woman's touch. I love clocks and watches. Most styles. But am still picky. The clock face is about 1'1/2 diameter and I will have to get some links taken out of the band. I like wearing them high, but they don't stay. Okay the problems; I don't know if it all works? I've had it for a while, but they must have not put a battery protector in and when I was checking it out, it was ready to run for a couple of seconds. It better be okay. I'm sure it's far too long to send back. *** . Happy shopping, in one of the Very Best Places to shop.....The Big O! Beautiful watch but the stainless steel band is peeling off. Beautiful watch and the perfect size of you have a small wrist but want to wear a larger watch. I had to get several links removed but other than that it is perfect! I Love this watch. Looks great and I get so many compliments about it. This watch is beautiful, I wear it almost daily and get tons of compliments. It can be worn dressy or casual. Shipping was quick as always! Great watch! Watch looked better online then in person. Did not last long due to stone falling out so I really didn't get much wear out it probably about 2 - 3 months max until it began coming apart. Would not recommend to anyone!! Beautiful watch great price it was agift could'nt ask for anthying more...The watch was true to picture. I love this watch. This is my go to watch, when I’m wearing silver. I love that it has a little bit of sparkle, but not too much. I got it almost 4 years ago and it’s still going strong! "Does this watch come with extra links to make the strap bigger?" "How is this guaranteed to be an authentic Michael Kors watch?" This watch is an authentic Michael Kors MK5353 watch. If you have any issues with your purchase, please reach out to our Customer Care team. "What are the function of the 3 small clocks"
This item features three sub-dials displaying: 60 second, 60 minute and 24 hour. "What are the use of 3 small clocks"
One of the smaller clocks is a 24 hour register, the second is a 60 minute register and the third is a 60 second register. "I just realized MK watches are made in China? Wow and people pay top dollar.for China made jewelry.we need to think twice!!" The Michael Kors model # MK5353 is made in China. you can say that again! DONALD TRUMP TO THE RESCUE!!! CAN'T WAIT!!! "My wrist is 7 inches,. Will this watch be too big"
Hello Sunshine, the watch has a 7.5-inch strap and should work well with your wrist size. You are also welcome to have a jeweler remove links to tighten the fit. Thanks for shopping with us. "Hello, can you tell me the diameter of the watch? i am curious to know exactly how big it will be on my wrist. thank you !" Hello amontalto92, the case diameter is approximately 39mm. Please let us know if you have additional questions. Thanks for shopping with us!